The Nigerian General Election ended in April and since its conclusion, Nigeria has seen a 50% drop in the price of machetes, triggered by the strong decline in post-election machete sales. Machetes are most often used in farming, but in Nigeria, they are also the weapon of choice for politician-sponsored thugs and goons. 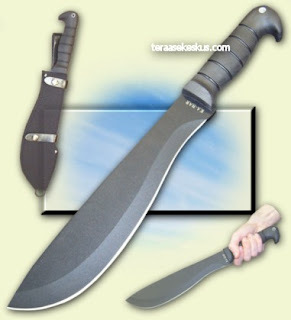 Now that the election is over, machetes just aren’t selling like they used to and the price has dropped from around $6.00 to only $3.00 (US) in just a matter of 3 months. Nigerian merchant, Usman Masi said "Before the conduct of the general elections, I was selling a minimum of seven machetes daily but can hardly sell one a day now”. The drop in machete prices has accompanied a drop in politically motivated killings which topped out at over 200 prior to this year's election. You know, in Nigeria, around the time of an election, goons buys more machetes so they can slaughter the political competition. Yeah, I’m still kind of thinking that Nigeria might have a better democracy than they U.S. at this point. At least Nigerian politicians stab you in the front.